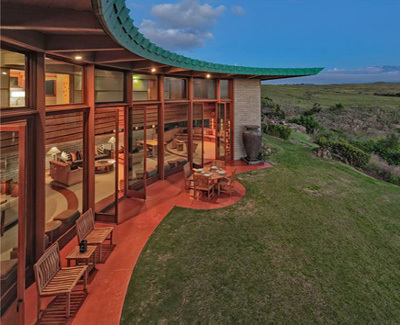 The only Frank Lloyd Wright home built in Hawaii is now available for your next vacation. This 3 bedroom, 3.5 bathroom architecturally significant residence will comfortably accommodate a family in a setting that is truly one-of-a-kind. Features of the home include a complete kitchen with upgraded appliances, an expansive living area (with a fireplace) and an outdoor lava-rock hot tub overlooking the ocean and breathtaking mountain views. The bedrooms are located upstairs and "float" over the main level of the house. The master bedroom has superior views with a private bathroom, walk-in closet and private outdoor balcony. The second bedroom has it?s own private bathroom with a queen size bed. The third bedroom has two twin beds and the fourth bedroom is currently being used as an office and/or playroom. There is a grass yard in front of the home that is shaded in the morning, making for the perfect space to have an outdoor breakfast or to practice yoga.